Almost every online store has a customer's personal cabinet. But in order to get it, you need to register, where you have to fill out forms with your data. But there is a faster registration via Facebook. In order for everything to work properly, we need to have the values: "App ID" and "App Secret". Click on the link, click "Create App" and fill out the form. 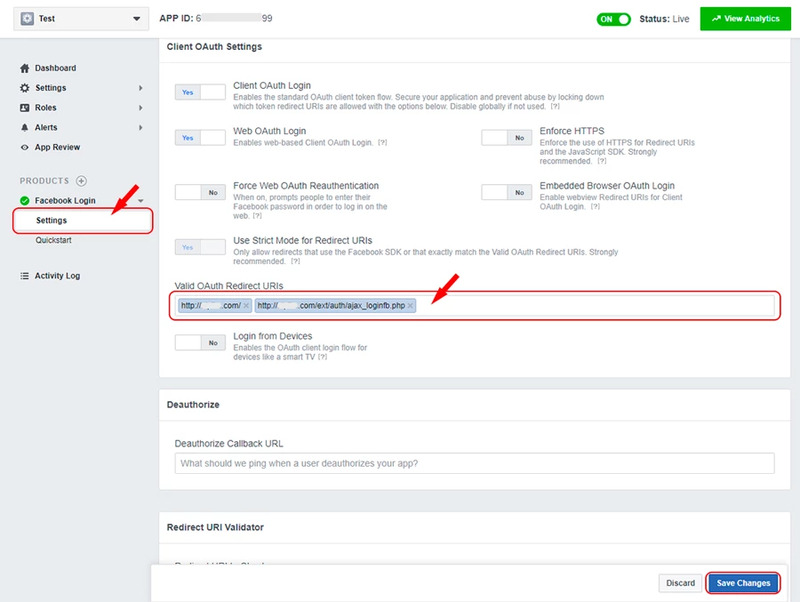 After you have assigned a name to your application, you need to select the "Facebook Login" tab and click the "Set Up" button. In a new window, select "WWW"
Next, you enter your data and make the necessary settings on your site. At the end of the settings, you will be offered to study the documentation pages where you will find additional instructions. Attention: When buying our templates, you do not need to write program codes in the settings of your site, they are already there. the address of the page on your site where the user agreement for the Login dialog is placed (if it is not, you must create or enter the address of any other page, for example, Contacts). All save and go into the advanced settings of the application. They are also in the left column, only below. In the "Valid OAuth Redirect URIs" window, prescribe the address of your site and this address: http: //your_site/ext/auth/ajax_loginfb.php (instead of the inscription "your_site" you need to insert the address of your site. In the same window, we copy the required values to us: "App ID" and "App Secret". The first stage is passed. It remains to insert the copied values in the admin area of our site. To do this, we go through "Configuration / My Store" and insert the value that we copied in the "App ID" window next to the "Facebook app ID" header, and paste the value that we copied in the "App Secret" window next to the "Facebook secret key" header. Everywhere, we save everything by clicking "Ok".